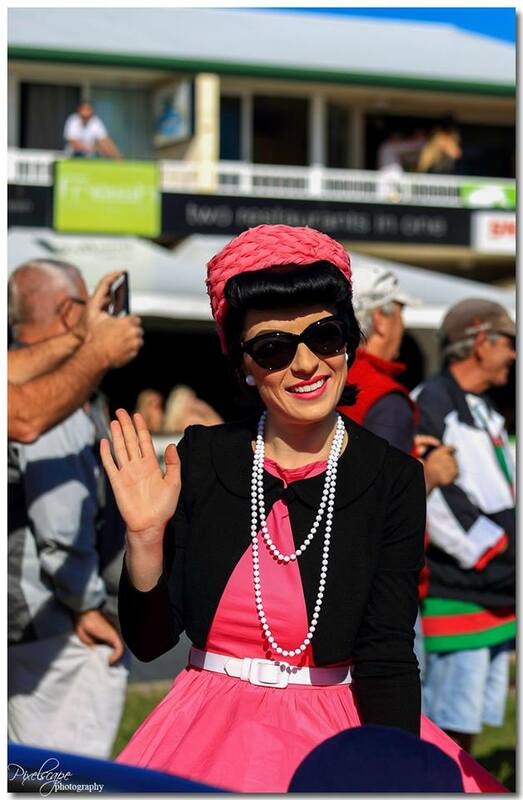 It’s been a busy few weeks following Miss Cooly Rocks on and I am excited to finally sit down and put fingers to keyboard to write about what was a truly great weekend. Miss Cooly Rocks on is the third pinup pageant I am lucky enough to have been a part of this year and I think I enjoy them more and more each time. The weekend started on Friday evening of June 6. I clocked off work early to make my way down the coast and begin the first of many make up applications and hair styles for the weekend. Throughout the week I normally keep things very low key. I’m normally sans makeup altogether and sporting a boring pony tail or bun. I like to glamorise this by thinking of it as “the girl next door” look. Really I’m just a boring plain Jane! I had a little time to settle into the place my family had booked in Kingscliff before they arrived. I really was grateful they decided to come along and be a part of the weekend with me. My 13 year-old sister even helped me with my hair on Friday evening. Trying to roll my tresses up at the back proved very problematic given I do not possess go go gadget arms, so I was happy she came to my rescue! I decided to pull out the big guns and flaunt my newly purchased and not yet worn, beautiful dita cardigan to form part of my meet and greet outfit. I teamed this with a full skirt with matching blue trim and my Mary janes of course! We headed into Cooly to meet at the Coolangatta hotel. 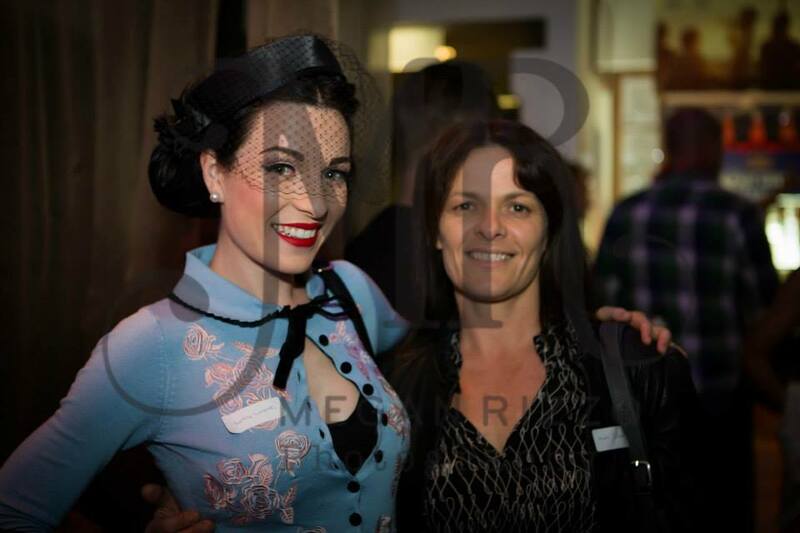 My mum was my plus one and it was nice to have her by my side. My mum and I have very different tastes in a lot of things, so it meant a lot to me that she came along and mingled for a while. It was great to see some familiar faces (Channy, Nerida, Kate and Jessica :D) and to meet some new ones too! 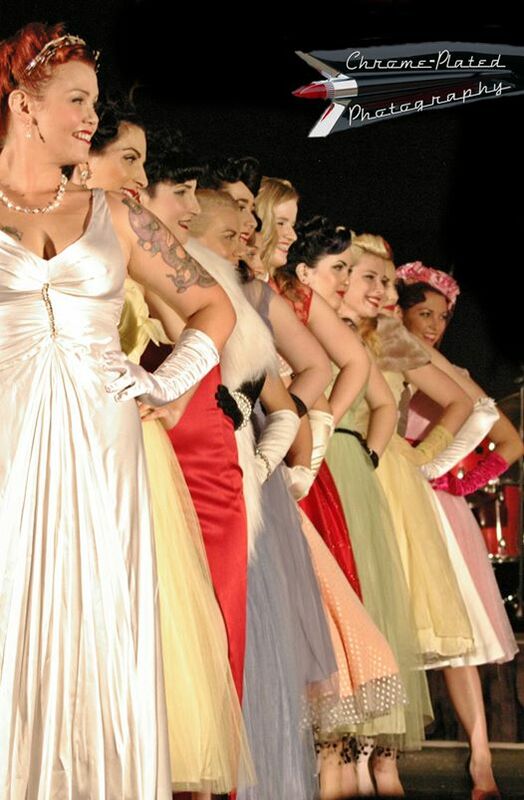 One of the things I have loved most about becoming more involved in the pinup scene, is all the wonderful ladies I have had the pleasure of meeting. Karen, Donna and Bree organised a fabulous evening for us all and Megan Rizzo was there to snap up every moment from behind her camera. I think the highlight of the meet and greet was when we were all surprised by…pillows with our faces on them! Sponsors Pacific Pillow Co had been busy printing our piccies onto pillows as part of the prizes for each and every lady selected as a finalist. How lovely is that! We strolled up to the marquee to be given our finalist sashes. 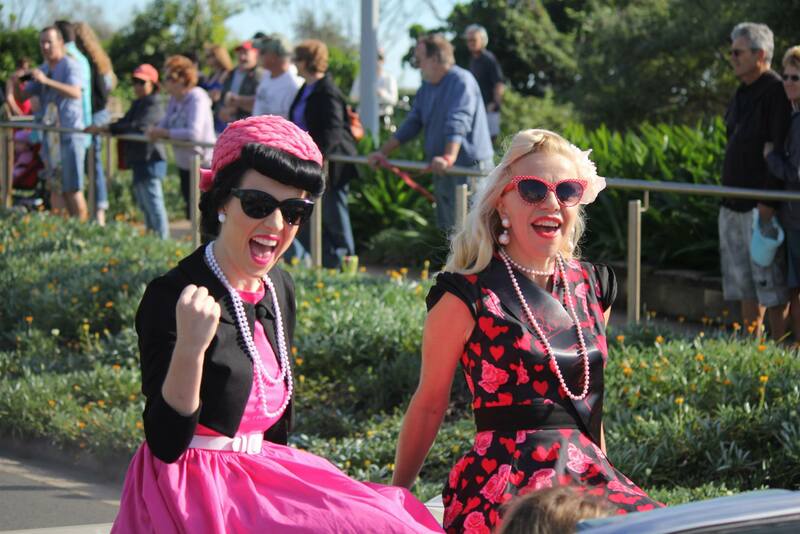 After a few piccies most ladies quickly fled to get home and start clocking beauty sleep hours before we had to be back at the surf club bright and early for a live television appearance…. 5:30AM my alarm went off. Despite being pretty stuffed I knew that it was going to be a fun day ahead so up I got! Round two of hair and makeup: I opted with pinning all my hair up again. Riding in a convertible vintage car in the parade, I wanted to look elegant, not windswept! 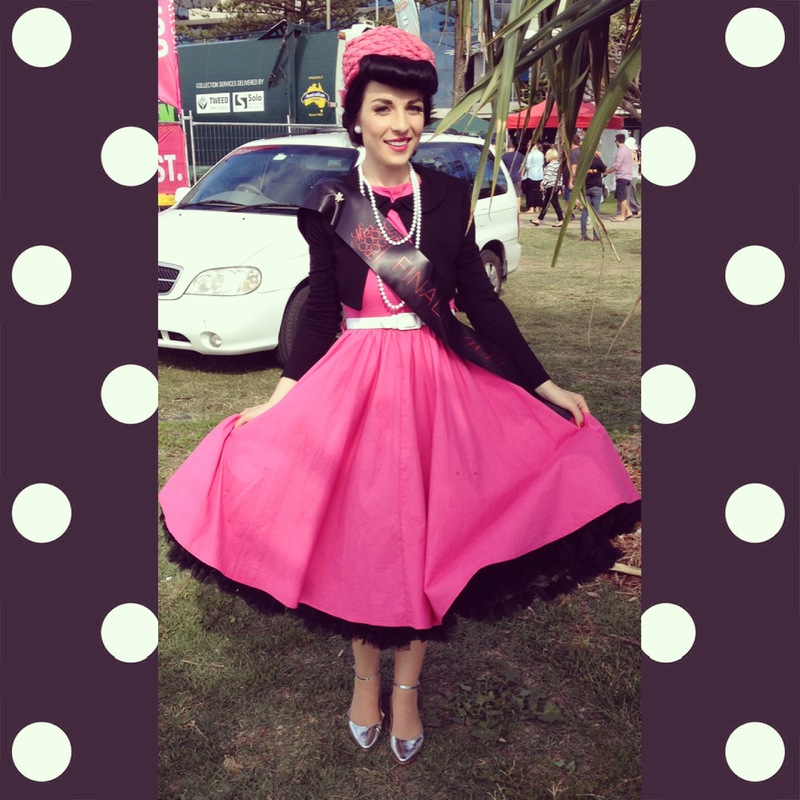 My parade outfit was a gorgeous pink number with a matching hat, black bolero and some cute silver ballet shoes. I wanted something fun, yet comfortable for the day ahead! Heels were out of the question. I didn’t want those around me to be subjected to whining about sore tootsies! It was a bit of a mad rush to get ready. My hair is SO TEMPERMENTAL and because there is so much of it, it can be hard to recover from when something doesn’t quite go to plan. I managed to arrive at the surf club only a little late, only to realise I had left my sash at home. My heart sunk a little as I looked around and saw all the lovely ladies sashing it up. After a quick sook it was time to get on with things. The TV appearance and parade would go ahead: sash, or no sash. It was time to get on with things! The lovely finalists and I had a ball being on TV! Got a message from the family and my Nan and Pop to say they had seen us all! They had us walking in a loop beside the reporter (think…. 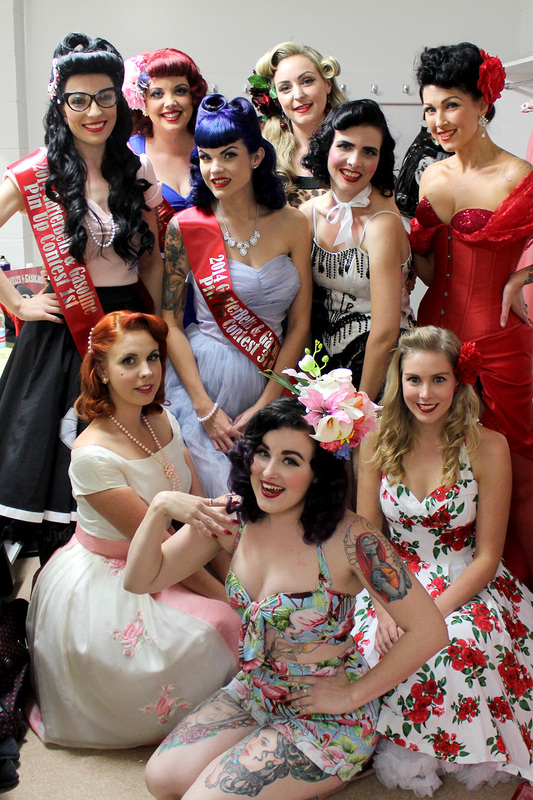 a pinup rotisserie), all showing off our outfits and striking a pose. It was over before we knew it and time to get ready for the parade. 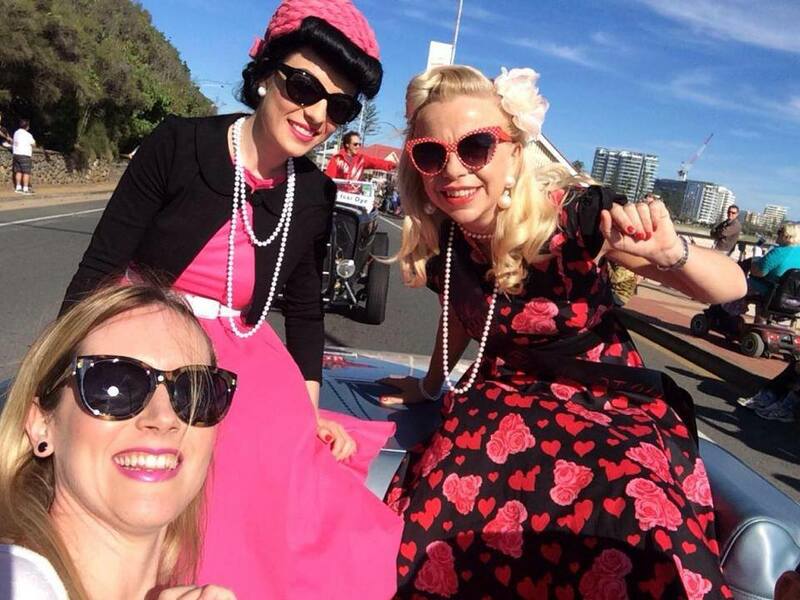 We were swept off in some gorgeous cars to wait where the parade would start in Kirra. We waited here for a little while and then Kristie (Lady Lou) and I were swapped into a different car with Kellie and her Dad. I had an absolute ball with Kristie. She’s an absolute scream and one hell of a woman. I was pleased to be bunked up with her in the back of the mustang for the duration of the parade. Now the parade itself was simply amazing. So. Many. People. I think I speak on behalf of all of us girls when I say I had a sore face and cheeks from smiling for so long! It was truly wonderful, driving along, waving at all those who had come to watch the parade. 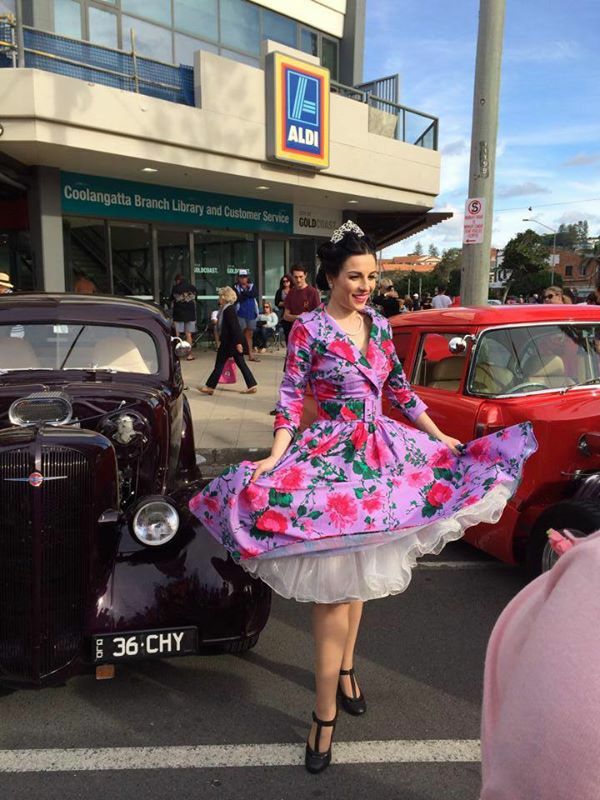 I most enjoyed seeing the faces of all the children simply light up in awe of the beautiful cars and pinup ladies riding in them. My aunty, uncle and their children had even driven up from Ballina to watch. It was great seeing some familiar faces in the crowd. Chilling in the back with Kristie with Kellie cruisin’ up front! My family brought my sash too, and my dad handed it to me as we went past in the car during the parade! Life savers! I was no longer the odd sash-free one out! Following the parade we were free to wander around, also handing out some pamphlets for our amazing sponsors. I caught a bite with my family and then headed back to the apartment to sit still for a few moments before re-doing my hair and makeup ready for the big night ahead! At home I practiced my poses a little so I had some idea of what I was doing once I got out there on the runway. Although I think the ability to improvise is a useful on, I do believe it’s good to go in prepared! I’m a pretty big stress head and work better if I do my best to remove pressure from situations. I think some gals prefer to improvise and that works for them. Lollies and protein bars became staple food items over the weekend. After gobbling some of these, I went about beginning round 3 of getting dolled up. 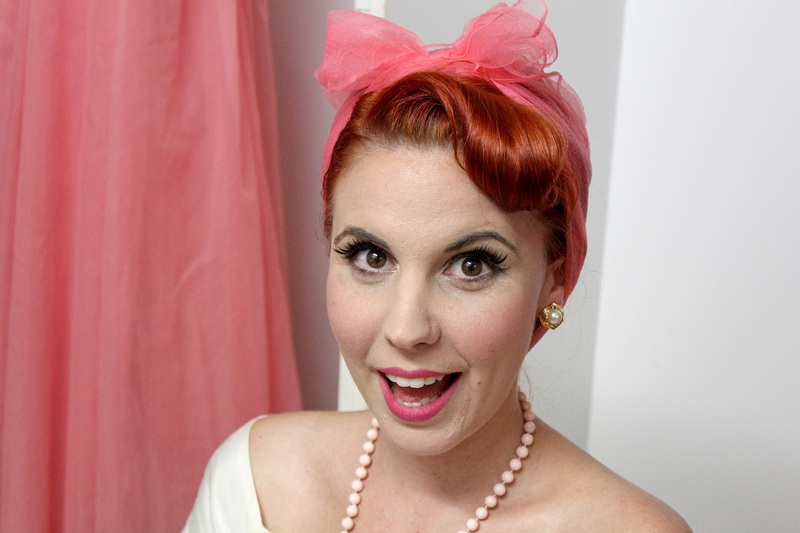 My hair really started to misbehave this time around: Victory rolls really will be the death of me. Luckily, I got all my outfits and accessories organised BEFORE starting hair and makeup. So despite it taking much longer than I had hoped I quickly through all my belongings in the car, gave the family a smooch and tripped it into Cooly. I haven’t mentioned up until this point that I get major parking anxiety. Despite going on 25, I have only had my licence for a couple of years. I’m much better than I used to be, however I still get slightly anxious about driving in unfamiliar locations, especially when I have to park! We had been given passes to park under one of the shopping centres, however this still meant driving through closed roads to get to the underground entrance. Through the day it had been fine, but for some reason, the traffic guys sent me to drive through the main street everyone was walking through. So picture this: Little old me, Wearing all my makeup and hair done, driving along in my little swift…..at 5km so I didn’t run into anyone. Driving this slow, no one can hear you either! This made me a little late and was definitely a character building experience! I finally made it to the marquee and our little tent dressing room. If all of us ladies hadn’t become close by this point, this was definitely going to be a bonding experience! The lovely Bree took us through a walk through on the cat walk and explained where we should stop and pose and for how long. She also did a few funny demonstrations of what NOT to do. Words can’t do it justice…but I think my favourite was the walk….half pose and keep walking….another half arsed pose and a half smile….You get the picture! After the run through, we retreated to our dressing room tent and started getting into our daywear outfits so we were ready to go. Start time crept up really quickly and before we knew it, it was time to step out onto the stage for the first time. 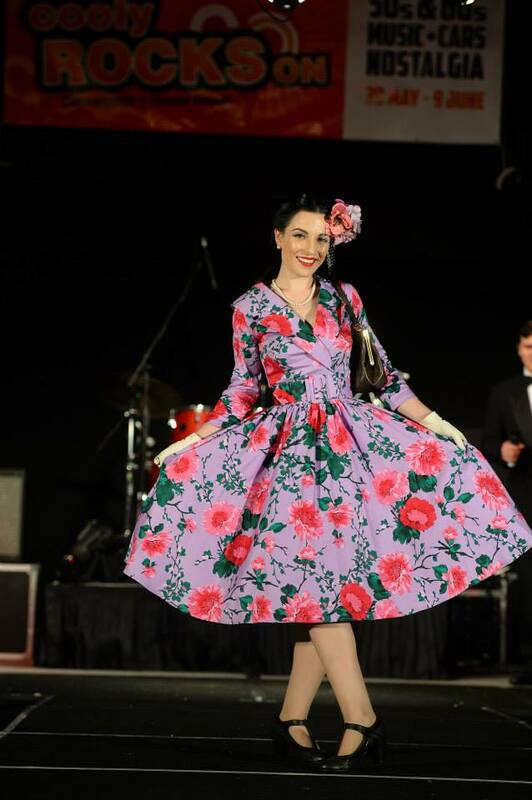 For daywear, I wore the always gorgeous Pinup Girl Clothing dress in lavender, teamed with a custom made Lady Rowe hair flower, some cute little cream vintage gloves that were an op shop buy, a vintage bag I picked up on eBay and my trusty Mary janes. 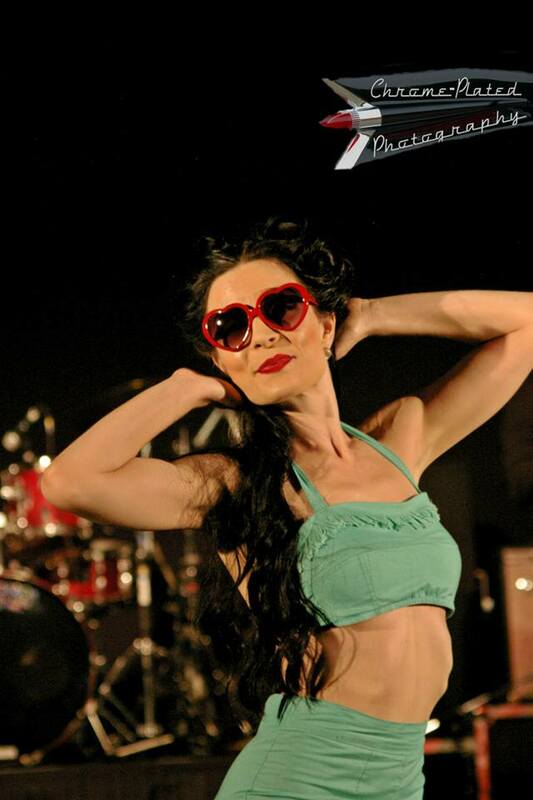 Wearing my custom made hairpiece at Miss Cooly Rocks On- Photo by John Gas for Cooly Rocks On. I was a little worried my little compact mirror might slip out of my gloved hands but all systems were go and I managed to keep a firm grasp on it! The first round at a pageant is always a little shaky. You walk out, not knowing what to expect from the audience. In my case, I didn’t actually have any of my immediate friends or family there to see me so I was sans cheering squad and hoping I could rouse some applause and cheers from the audience! We didn’t have a lot of time to change into swimwear and it was lovely to see the girls who had more time, helping the girls who were busting their buts to nail the quick change! For swimwear, I wore a playsuit made by the lovely Amber of Little Miss Riot, teamed with my love heart sunglasses and black wedges. Of course I had my beach towel handy, and a pineapple shaped cocktail drink! Swimwear was fun! I challenged myself by getting done on the ground (another thing Bree had warned us to be cautious about!) I felt confident and had a lot of fun. 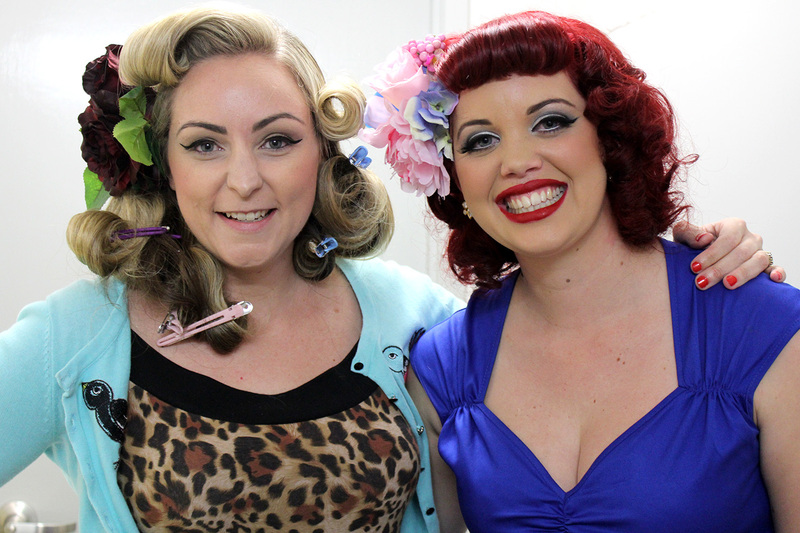 I enjoyed watching the couple of ladies who were before me as I was waiting to go up on stage…but at this point we began to realise we hadn’t seen a lot of our fellow contestants outfits as we had madly been trying to get changed! After a quick photo, it was back into the tent for the final change: Eveningwear. This was without a doubt, the section I was most looking forward to. 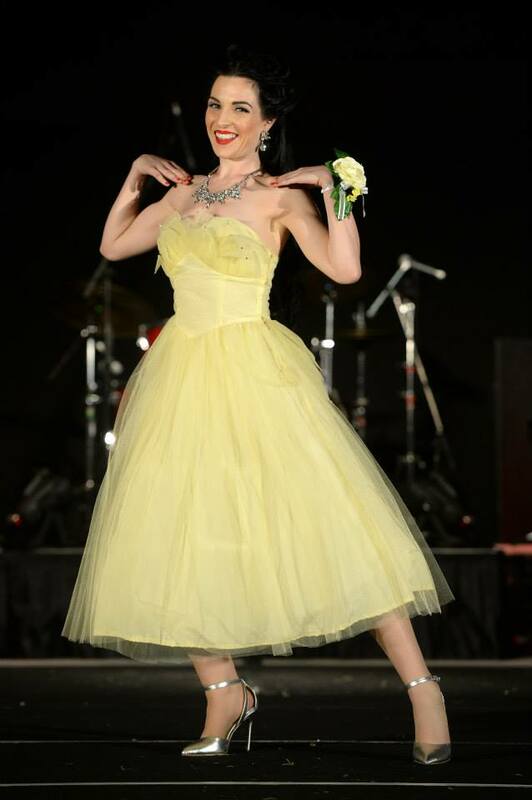 I had a gorgeous lemon vintage 50’s prom gown waiting to be worn for the first time! I had actually purchased this stunning number for Garterbelts and Gasoline…but didn’t end up wearing it. I team this with some blinging costume jewellery, a corsage I made myself and some pretty silver heels. If there is ever a moment where I felt like a princess, this was definitely it! Upon exiting the stage, Donna gave me what is possibly the best compliment ever. “You look like Belle,” she said. Everyone wants to look like a Disney Princess right?! I was on cloud nine just hearing that….little did I know what was to come! When all the rounds in a pageant are complete, there is an overwhelming buzz and sense of achievement that explodes in the dressing room. 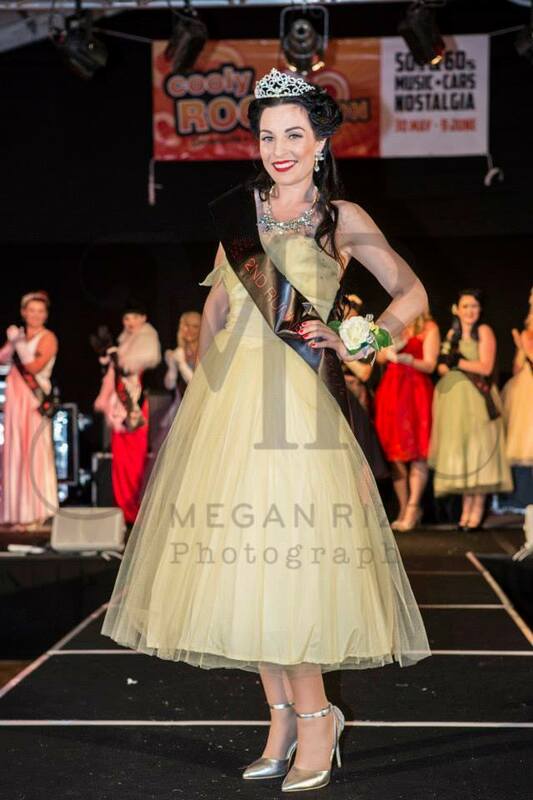 This is without a doubt, my favourite moment about competing in pageants. That moment when you see those around you have may have just conquered a fear, tried something new, and surprised themselves. It’s so wonderful to see that glow painted across someone’s face when they have achieved a goal or taken a step out of their comfort zone. This is definitely something that highlights (as corrrrrny as it is) that everyone is a winner in these circumstances. Sure, someone gets a crown or a sash, but I think it’s these feelings of achievement and being proud of oneself that is the real prize. It wasn’t long before we were all out on stage awaiting the big announcement. It was like Garter Belts all over again when I heard my name called for second runner up! The lovely Miss Cherie Amour (Miss Cooly Rocks on 2013) came and placed my sash and crown on me. 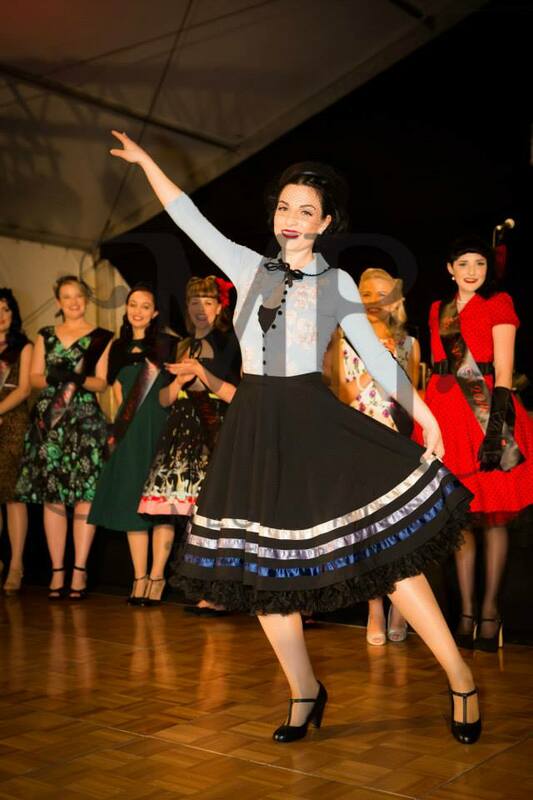 The crown wasn’t too fond of my victory roll hairstyle, and thus, I tottered down the catwalk for my lap with it vicariously balancing on my head! Shame there wasn’t a talent round! 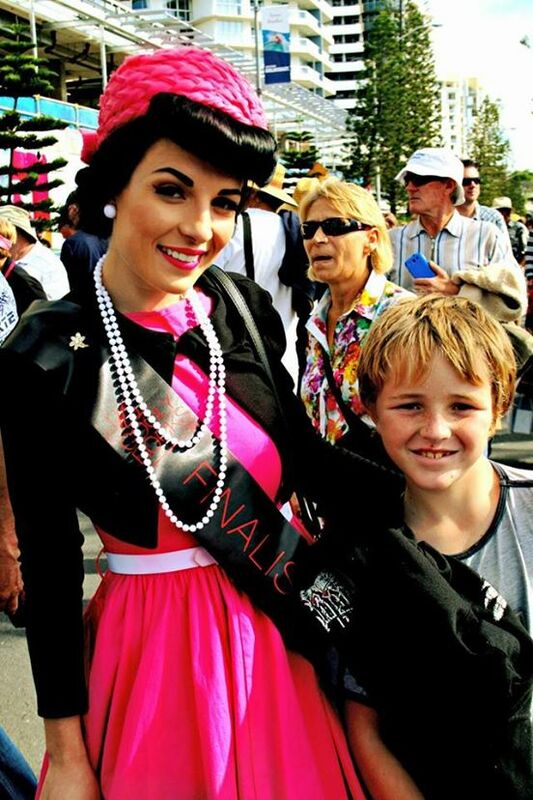 I returned to the line and cheered with excitement as the gorgeous Miss Kitten Darling was announced as first runner up! She looked simply stunning in her long white gown. She’d even managed to whip up an up-do in the short time we had to get changed: impressive! After her lap was complete, it was the moment everyone had been waiting for! MISS PETTICOAT POLLY! 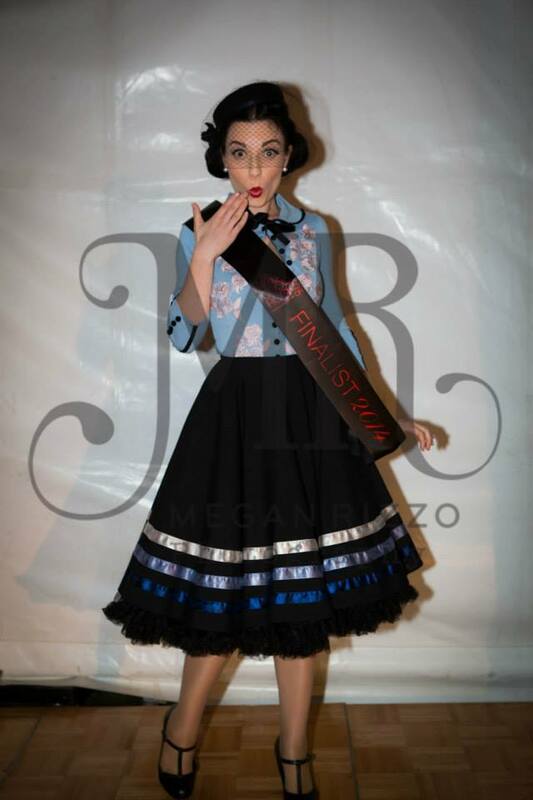 Miss Cooly Rocks on 2014! 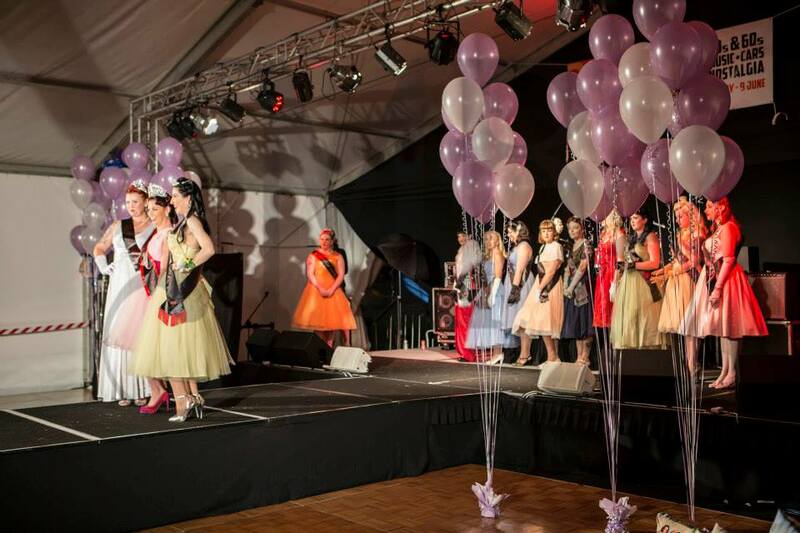 Cheers, smiles and applause filled the marquee as the gorgeous Miss Petticoat Polly was given her sash and crown. After a few photos, it was back into the tent to pack up. This was, of course, after we had been loaded up with prizes from all the amazing Miss Cooly Rocks on Sponsors. 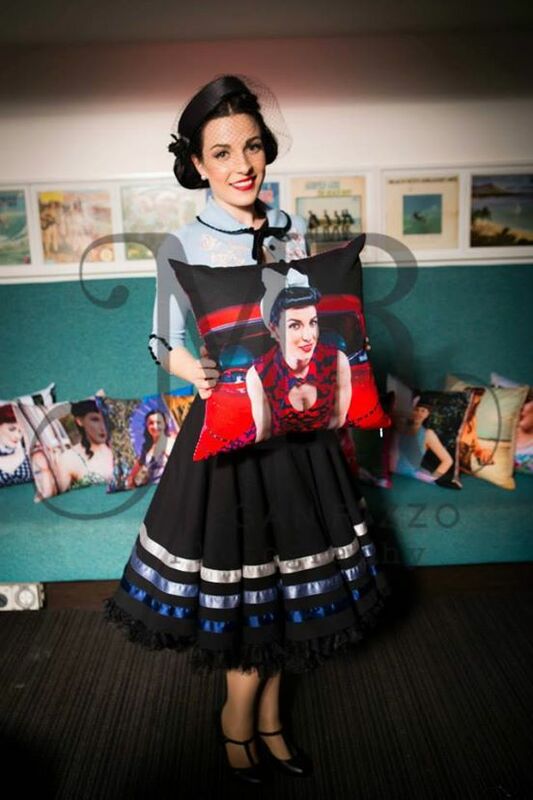 A big thanks to Pacific Pillow Co, Dead Gorgeous Cosmetics, Megan Rizzo Photography, Parasols with Love, Miz Smitten Kitten, That Shop and PinupSkool Magazine! 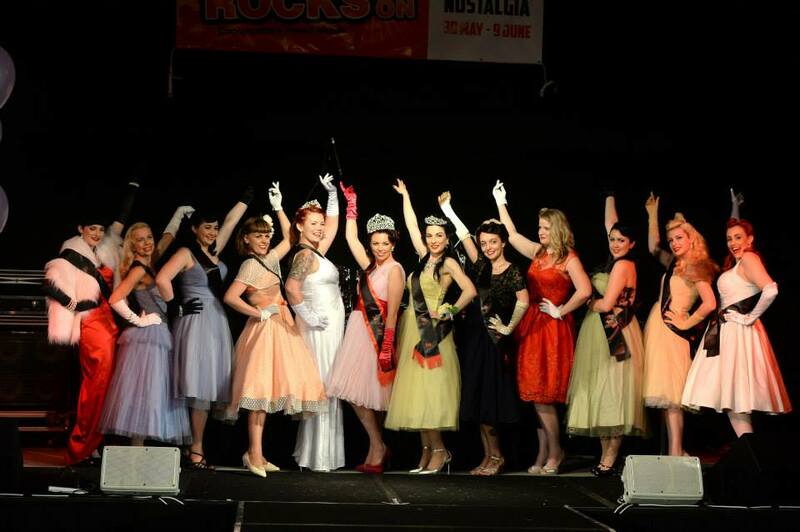 Also a big thank you to the winners of Miss Cooly Rocks on 2013: Miss Cherie Amour, Tululua Lollipop and Bommy Belmore. The goodies I received from all the fabulous sponsors! 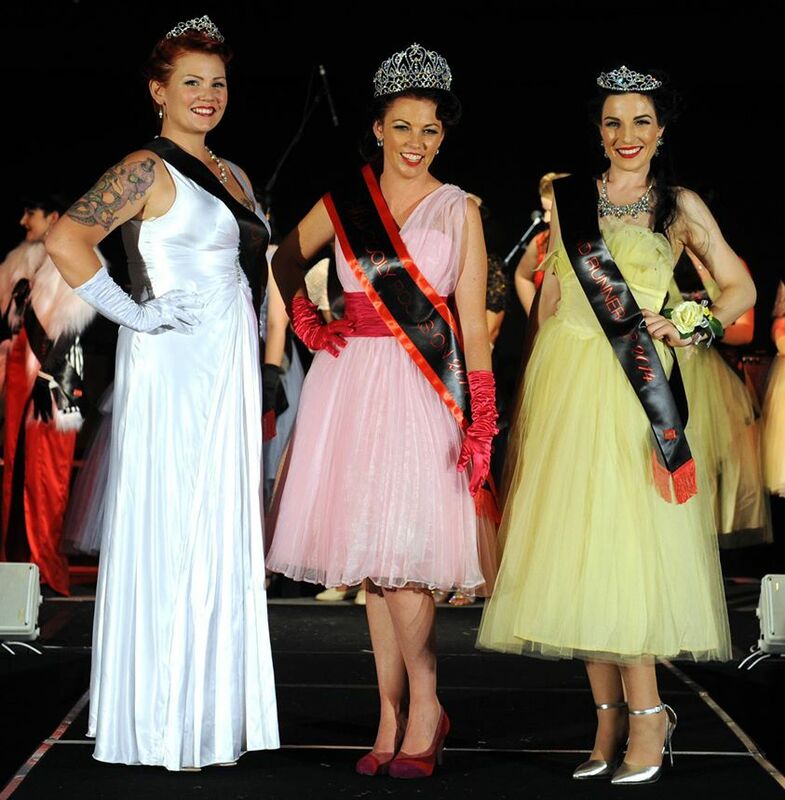 The lovely 1st Runner Up Miss Kitten Darling, Miss Cooly Rocks on 2014, Miss Petticoat Polly and I posing after the announcement! Proud moment! Photography by John Gas for Cooly Rocks On. All the lovely contestants. Photography by John Gas for Cooly Rocks On. It was at this point in the night that I began to wish my family and partner could have been there for the show. Of course, I had had a great time….but it is good to have your own supportive network present for you. This was one thing that was amazing about Garterbelts. I packed up my stuff fairly quickly and headed back to the apartment so I could show off my gorgeous crown and sash to my family. My partner got a selfie until he could see them in the flesh! I stuffed my face without every morsel of food available before retreating to bed. I was exhausted, but on such a high! On Sunday, I went out for a delicious breakfast with my Mum, Dad and sisters. While at the café, I got to hold a gorgeous Macaw. I’m a little bit of a crazy bird lady, so this was a major deal for me! The perfect way to end an already amazing weekend. 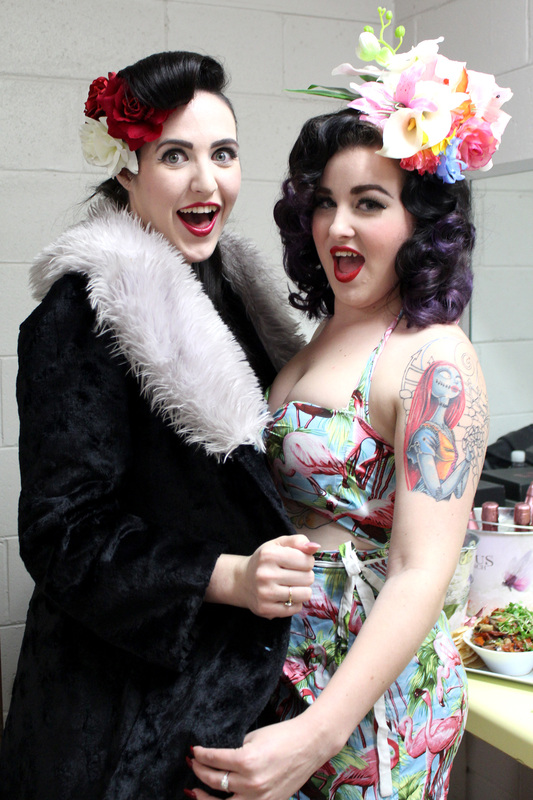 Afterwards, I made my way back to Cooly for some final photos with Miss Kitten Darling and Miss Petticoat Polly. Some photos to finish off the weekend. Just twirlin’ my skirt! Photo care of the lovely Petticoat Polly. By the time we finished up, I was well and truly ready to head back to Brisbane and thankfully the traffic wasn’t too bad. All in all, Miss Cooly Rocks on was an amazing initiative to be a part of. It was incredibly well organised, all thanks to the Karen, Donna and Bree. At a time when I wasn’t feeling positive about much else, this competition gave me a chance to channel some positive energy, meet some wonderful people and hang out with some amazing people I already knew. As I said, I thoroughly enjoy seeing people surprise themselves with what they are capable of and I saw this all weekend long. For anyone thinking about entering next year my advice would be: Don’t hesitate for a second.